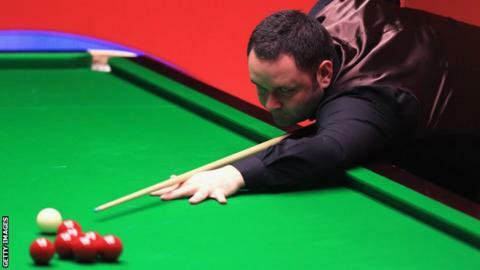 Stephen Maguire bowed out of the World Championship at the Crucible in Sheffield saying he is relieved that his nightmare snooker season is over. The Scot lost 10-9 despite fighting back from 9-6 down to force a 19th-frame decider against Ryan Day. "I am actually glad this season's finished," world number nine Maguire told BBC Sport. "It has been a season from hell for me. "I just want to forget it, but there's worse things in life." Maguire insisted that a recent back injury had not hampered his performance against the world number 20. "A couple of months ago, I was struggling, but the last two weeks, I've been perfect," he said. "It was nothing to do with that at all. "If I look back on it, I lost it in the first session. If the session hadn't ended at 6-3, I would have lost 10-4. "I was somewhere else. Being the next day, it gave myself a chance to fight back, which obviously I did." It looked like Maguire might complete his comeback to claim victory but expressed frustration that it proved futile. "I wish it had been 10-4, because I could be in the pub earlier," he joked. "Obviously I am going to fight to the death - it's the World Championship - and, when it went to the decider, obviously I thought I was favourite and, if I got a chance, I would do it, but I never and I can't grumble. "I had a chance in the last frame but never done it and that was it. "You hope for one chance, I got it and never did it and Ryan made a good break." Maguire lost in the Masters semi-finals to Ronnie O'Sullivan but failed to reach the quarter-finals in the German Masters, Welsh Open, World Open, Players Championship Grand Final or China Open.